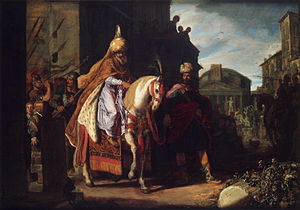 The Triumph o Mordecai bi Pieter Lastman, 1624. Mordecai[lower-alpha 1] is ane o the main personalities in the Beuk o Esther in the Ebreu Bible. He wis the son o Jair, o the tribe o Benjamin. This page wis last eeditit on 2 November 2018, at 22:00.